'Tis the season for...seasonal giveaways and tons of exciting news! New Short Story Published: First up... my flash fiction story, "The Tower" has been published in Zoetic Press's online column, Alphanumeric. You can read it online for free. Alphanumeric is a companion to Zoetic Press's quarterly literary magazine, Non-Binary Review; each issue of Non-Binary Review has a theme and the pieces published in Alphanumeric tie to the magazine's theme somehow. My piece ties to last quarter's theme of "Ali Baba and the Forty Thieves." "The Tower" represents my first short story to appear in print/be published. It's not the first short story I've sold, but of the four I sold this year, it's the first to be released. Please give it a read and, if you like it, click the "like" button and/or leave a comment. Letting the publisher know that you like my stuff increases the liklihood they will accept other works by me. 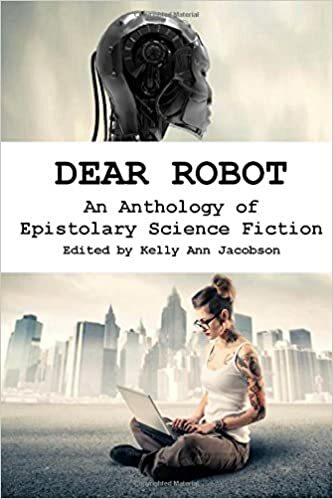 Dear Robot Anthology: The second of my short stories to be released is my story, "Welcome to OASIS," which appears in the Dear Robot anthology, just released this week. Woohoo! Dear Robot is a collection of 19 science fiction stories presented as episalatory documents - emails, transcripts, instruction manuals, and in the case of "Welcome to OASIS," a government website tutorial for surviving the incursion of an alternate reality. Dear Robot is now available in paperback from Amazon and book sellers everywhere. There is also a Goodreads giveway going on for 2 copies of the book. To celebrate the release of the book, editor Kelly Ann Jacobson has arranged a blog hop of the contributing authors - with each other sharing a bit about the inspiration for his or her story. Stop by my blog on Friday, December 4th, to learn what inspired me to write, "Welcome to OASIS." 'Tis the Season Blog Hop: Want to win some prizes? I mean, like, a LOT of prizes? Then check out the 'Tis the Season blog hop. More than 50 blogs are participating (including me!) and each one is giving away a prize worth at least $25. The Blog Hop runs December 1st through December 15th. Stop by my blog any time between those dates to enter my giveaway (for a SIGNED three-pack of paperback books) and to find the links to all the other giveaways. You can enter as many of the giveaways as you want (enter them all!) and there is no limit on how many prizes you can win (it's quite possible one person could win all the prizes). 2015 Christmas Advent Calendar: And if you need any Christmas ideas (for yourself or others), stop by Beck Valley Books & More's "2015 Christmas Advent Calendar." Every day between now and Christmas, Sharon will open another "door" on her advent calendar to reveal another featured book and a guest post by the book's author about their favorite part of Christmas. Hereafter and I will be featured on December 6th - stop by then to leave a comment about your favorite part of Christmas! You can find a link to the 2015 Advent Calendar on my website. Upcoming Appearances: I will be at the Webster NH PTO Craft Fair on Saturday, December 5th from 8 am to 2 pm selling and signing books - stop by and say hello! I will also be at the Manchester In-Town Holiday Market on Saturday December 12th. I will have several more giveaways and some other exciting news to share with you all next week. In the meantime, don't forget, my Amazon $50 gift card giveaway is still taking place. I need 17 more reviews of Hereafter on Amazon by December 20th before I can give away these gift cards. Won't you help me out? Review copies of Hereafter are available from me and on NetGalley.